OTTAWA -- High-level meetings are set to resume this week in Washington in an effort to bring Canada into a revised North American Free Trade Agreement. Trudeau was asked about two incidents that irked Trump -- the first being comments he made during his press conference in Charlevoix, Que. 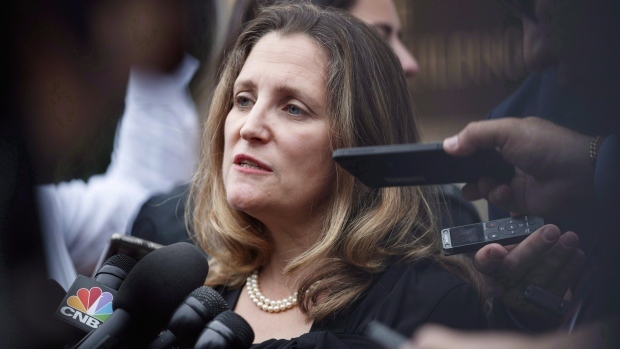 after the G7 summit and secondly -- Freeland's acceptance speech at an award ceremony in Washington where she denounced Trump's "absurd" tariffs and argued for the preservation of the world's rules-based order -- with or without the United States. Quebec Liberal Leader Philippe Couillard has warned there will be "serious political consequences" if there is any further dismantling of the protections for dairy farmers through NAFTA negotiations. The issue was expected to play prominently Monday evening in the provincial party leaders' second election debate -- this one in English. Ontario Premier Doug Ford and his economic development minister, Jim Wilson, were scheduled to travel to Washington on Wednesday for an update on the NAFTA talks, which the premier characterized as critical to his province's agriculture, automotive and steel industries.